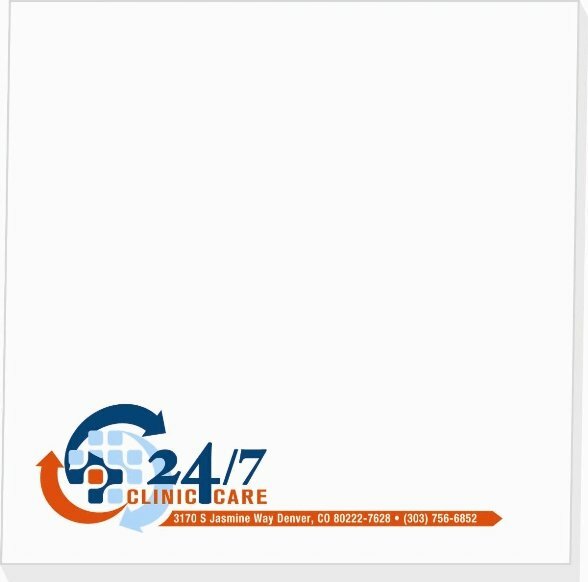 Brand name sticky note pad in a 4 w x 4 h size, 50 sheets per pad with a logo. Sticky notepad features are quality white paper or customize with flood coat. Utilize a flood coat on the top of each sheet to customize your paper color. Custom flood coat is no extra charge. Specify from the print colors page. You must order custom sticky notes in whole increments of 500 units. Rush Production is available at no additional charge if necessary. This sticky note pad is Made in the USA for American Jobs. Price includes std. four color process printing in an area 3 5/8" w x 3 5/8" h.
No Set Up Charge. This includes custom flood coat printed pads. Logos require Illustrator, In Design or Photo Shop ai, eps or pdf. Need logo art services? We staff a full service art department.